Reading and share top 3 famous quotes and sayings about Airline Business by famous authors and people. Browse top 3 famous quotes and sayings about Airline Business by most favorite authors. 1. 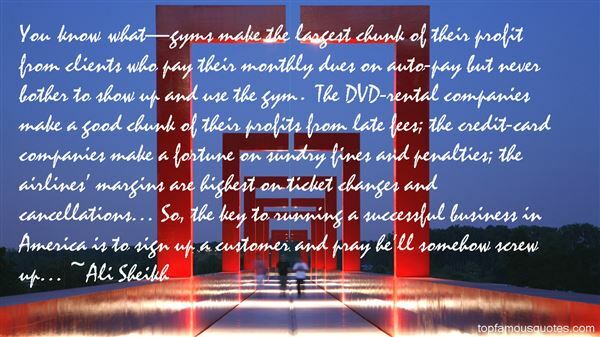 "You know what—gyms make the largest chunk of their profit from clients who pay their monthly dues on auto-pay but never bother to show up and use the gym. The DVD-rental companies make a good chunk of their profits from late fees; the credit-card companies make a fortune on sundry fines and penalties; the airlines' margins are highest on ticket changes and cancellations… So, the key to running a successful business in America is to sign up a customer and pray he'll somehow screw up…"
2. "The airline business is the biggest team sport in the world. 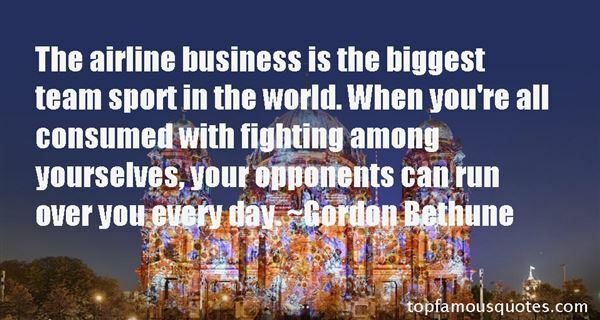 When you're all consumed with fighting among yourselves, your opponents can run over you every day." 3. 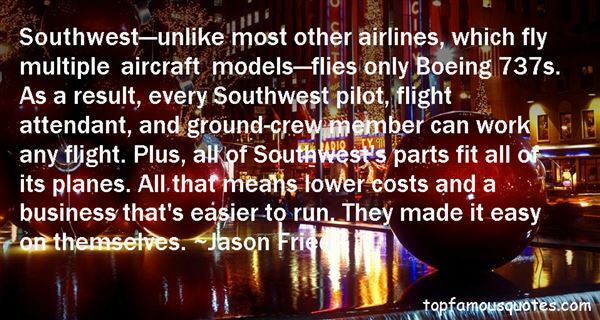 "Southwest—unlike most other airlines, which fly multiple aircraft models—flies only Boeing 737s. As a result, every Southwest pilot, flight attendant, and ground-crew member can work any flight. Plus, all of Southwest's parts fit all of its planes. All that means lower costs and a business that's easier to run. They made it easy on themselves." Hunger is almost like something the West does. It's almost like the direct result of the way the West performs."